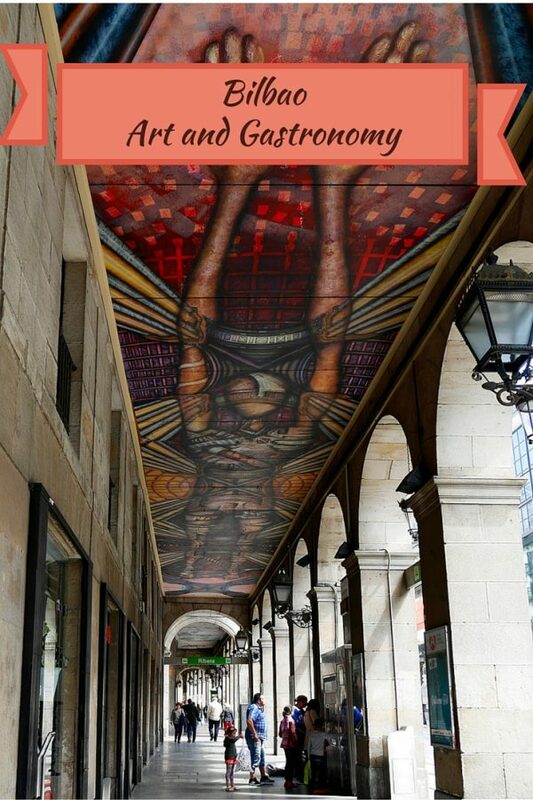 Just back from a five-day gastronomy tour of the Basque Country, which took me from Bilbao to Vitoria-Gastiez to Rioja Alavesa then San Sebastian, before returning back to Bilbao, I’m still enthralled by the wealth of food and the cultural heritage of the region. 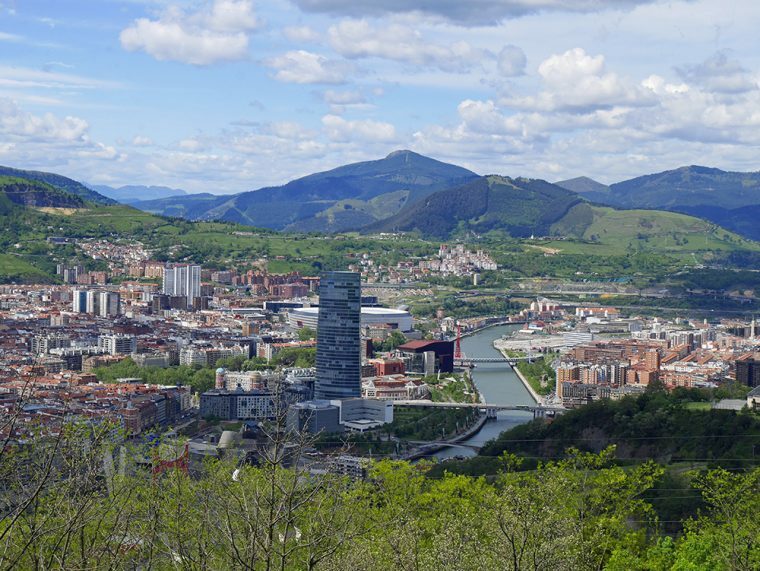 This is an introduction, nothing more, to Bilbao, set in a part of Spain which manages to retain its own distinctive identity and which has, over the last thirty years or so developed a fine dining scene second to none. My aim – to discover just how that came about – and, of course, to do so by trying some of the food and wine that makes this part of Spain so special. 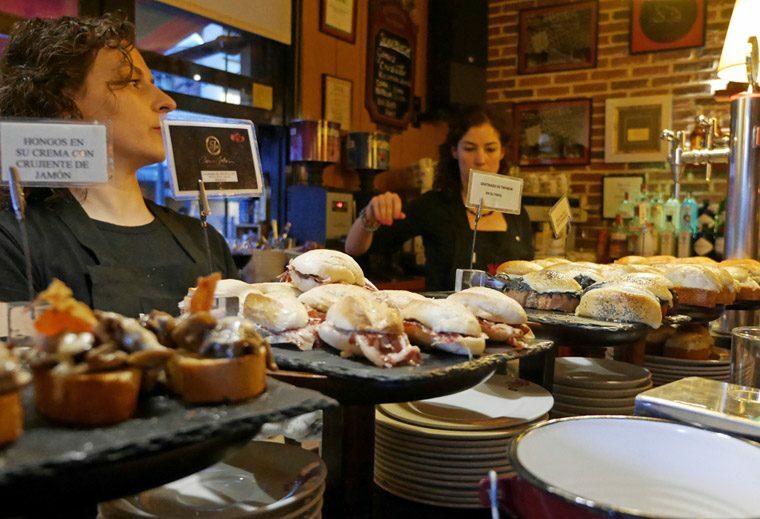 The first places to explore when you arrive in any of the Basque towns and cities are pintxos bars. Pintxo means “spike” in the Basque language and refers to a wide variety of little snacks from the region Peer into any bar in this area during lunch or in the evening and you’ll find the counters laden with pintxos. 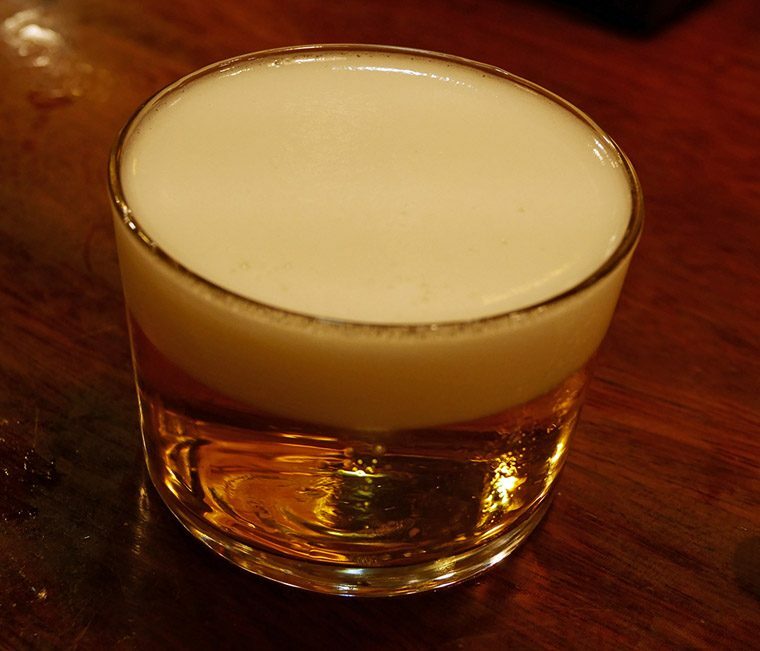 The classic pintxo is called a ‘Gilda’ (pronounce ‘Hilda’). 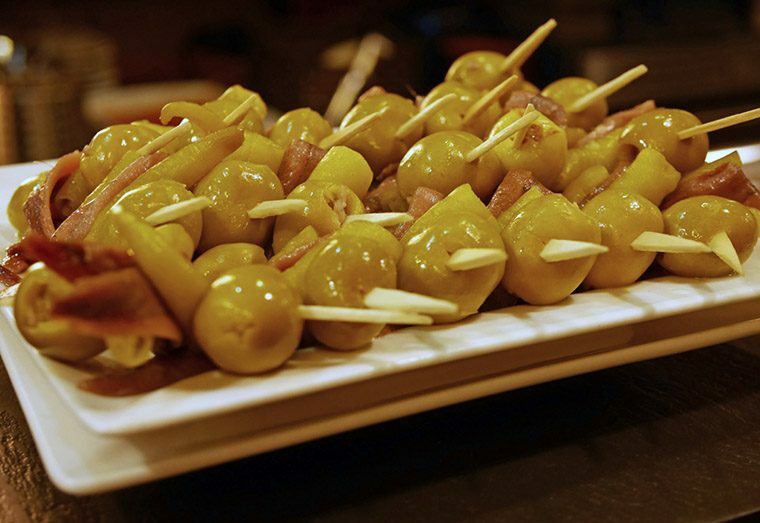 It’s a piquant mixture of anchovy, peppers and olives on a cocktail stick which gets its name from a Rita Hayworth movie, in which the Spanish-descended actress plays a bold and saucy femme fatale. Basque women are famously strong and independent, I was told that the origin of the pintxos and of the small glasses of beer you’ll find for sale came about because the women used to send their husbands out for a beer and something to keep them going till supper time – with just enough small change to make sure they didn’t eat too much. How true that is, I don’t know. And pintxos have evolved into a real gastronomic art form as we found out later on our trip. In Bilbao we started at El Globo where we ate anchovies, Gernika peppers (like rather large padron peppers, gratinated asparagus and txistorra (a local sausage). 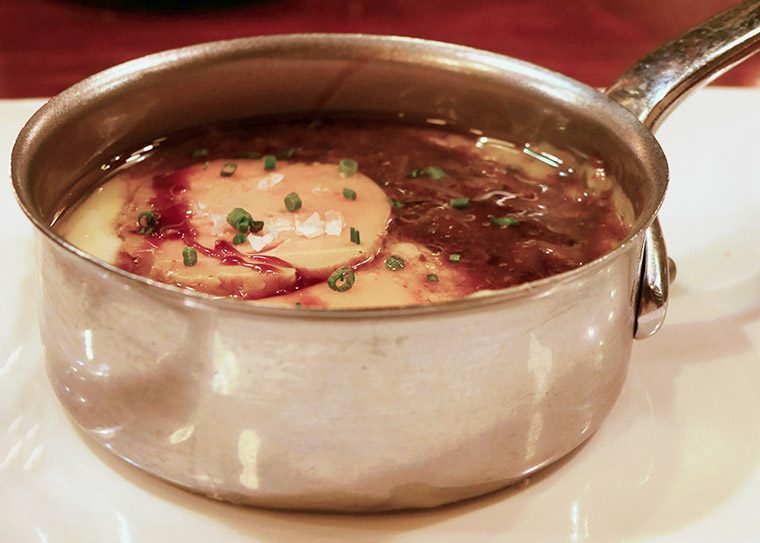 We moved on to La Vina del Ensanche, arguably a more ‘foodie’ experience, where we ordered ‘mushrooms’ and got a small, copper pan containing foie gras, mushroom and egg yolk, all baked into a hedonistic delight. We also feasted on rather too much Iberica ham, tortilla, octopus and the aforementioned gildas. It seemed very hard not to eat far too much. But then, our day had started early, with a flight at 7.30am. And, we’d packed in a trip to Artxanda Mountain when we arrived so that we could see the whole city, followed by lunch at La Ribera (yet more delicious food, in this case bought from the market on the floor above and freshly prepared daily). 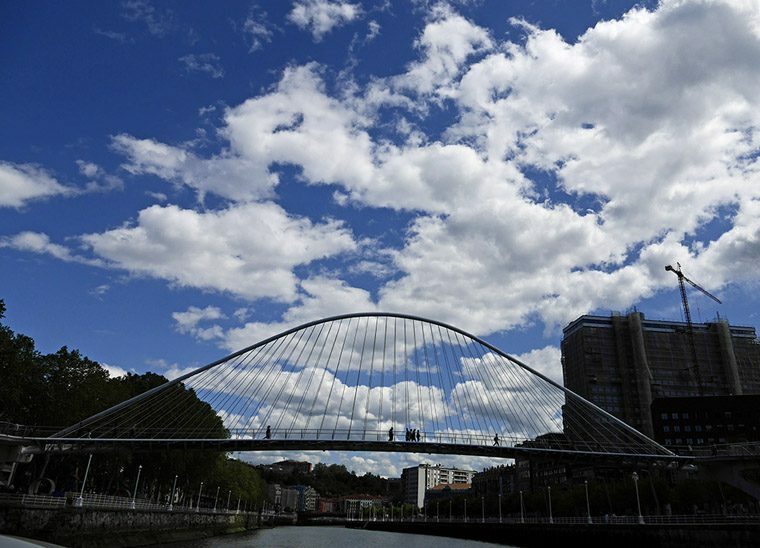 Then, a stroll through the city and a boat trip along the Nervión river and Estuary of Bilbao. As a first time visitor to Bilbao I was amazed by the contemporary architecture as much as by the food. 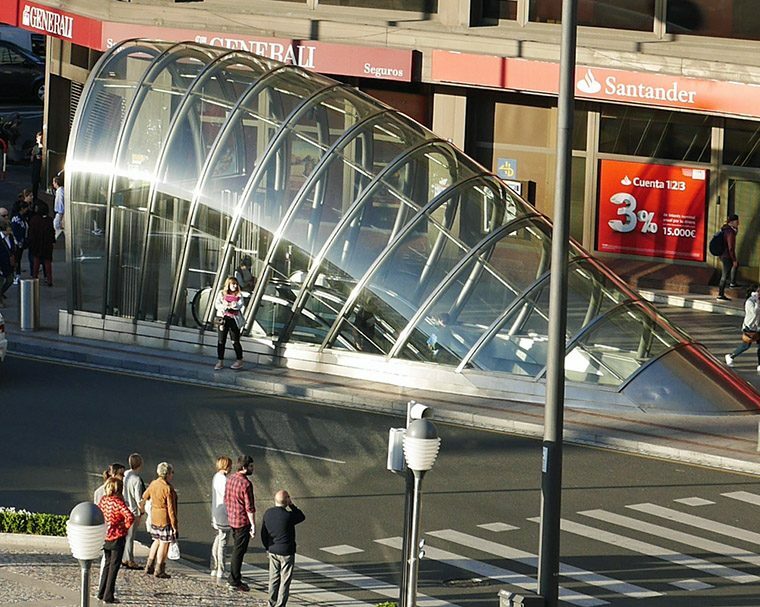 Even the entrances to the metro were designed by Sir Norman Foster. Staying at the stylish, classical Hotel Carlton, I was lucky enough to have a tiny balcony looking out over the City. I could have sat there all night, watching the passers-by, but for the promise of a Spanish breakfast the next morning. 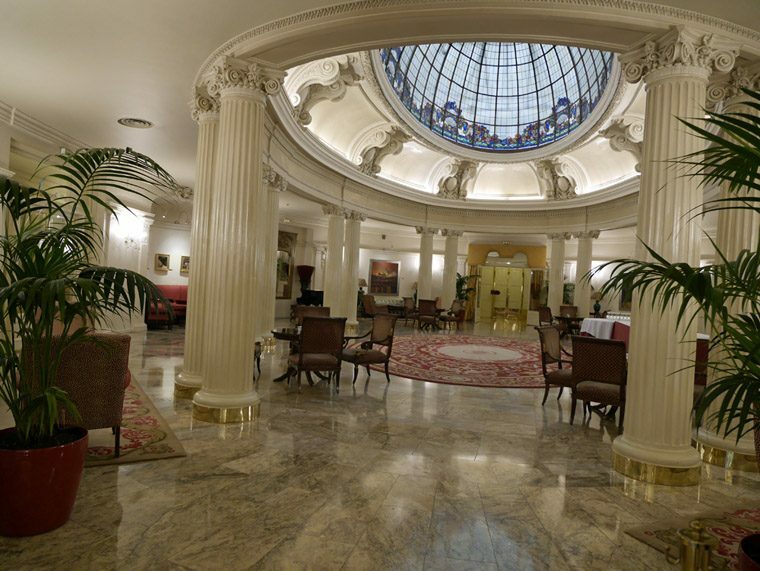 Completed in 1926, the hotel was designed by Basque-English architect Manuel María Smith Ibarra, a grand traditional building in the French Second Empire style. 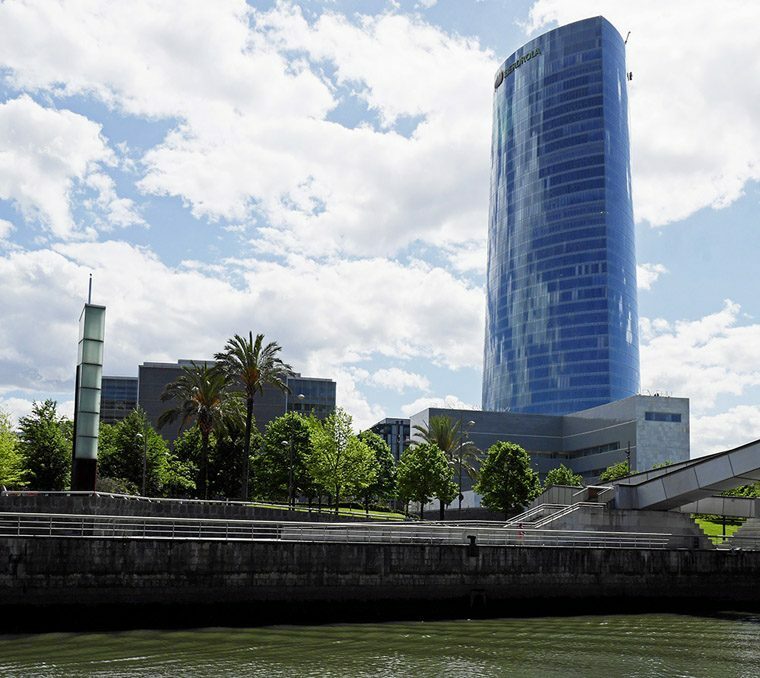 through to the Iberdrola Tower, designed by architect César Pelli, and the tallest building in the Basque Country. 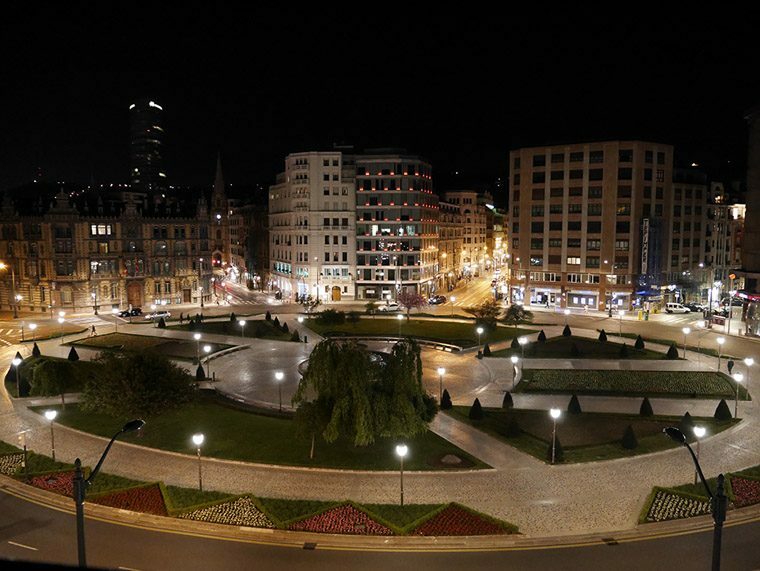 This is a city which has regenerated as centre for services. 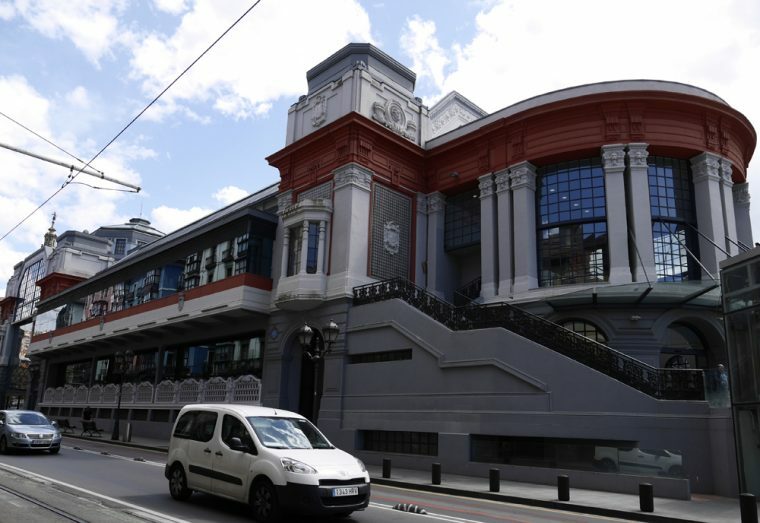 One which has kept the trappings of its heritage as a port and industrial leader but has created an amazing contemporary infrastructure sitting alongside historic buildings to house the new businesses which are central to the city’s economy. The result is spectacular. Of course, we were there on a gastronomy trip, but for me at least, understanding the cultural heritage and current infrastructure is essential. 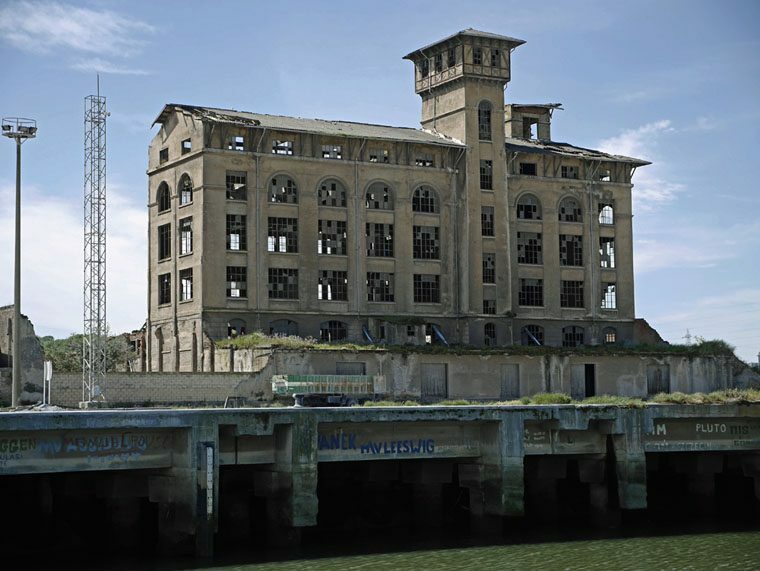 The city’s background as one of the leading Ports of Spain and as the main centre for the iron industry in Spain created a rich economy and an affluent workforce. The subsequent collapse of the iron industry led to an era of austerity. 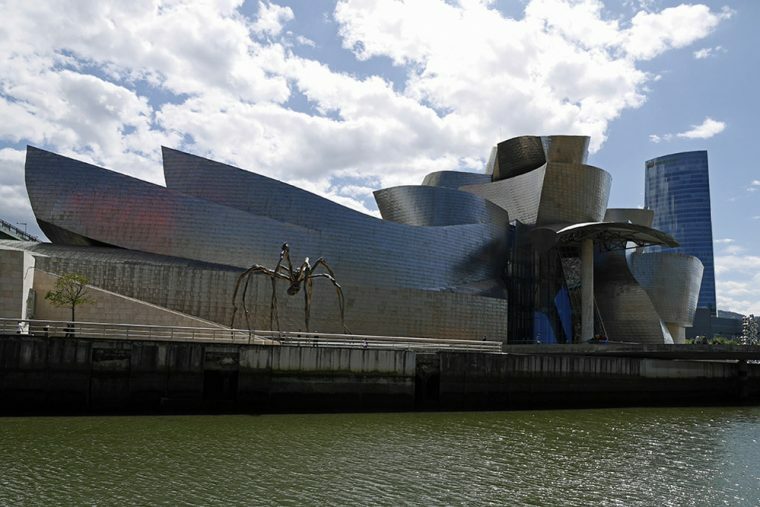 Then, the regeneration of Bilbao, with the Guggenheim Museum as a flagship building marking the city’s new direction happened in parallel with the evolution of a new Basque cuisine, in Bilbao, San Sebastien and across the region. 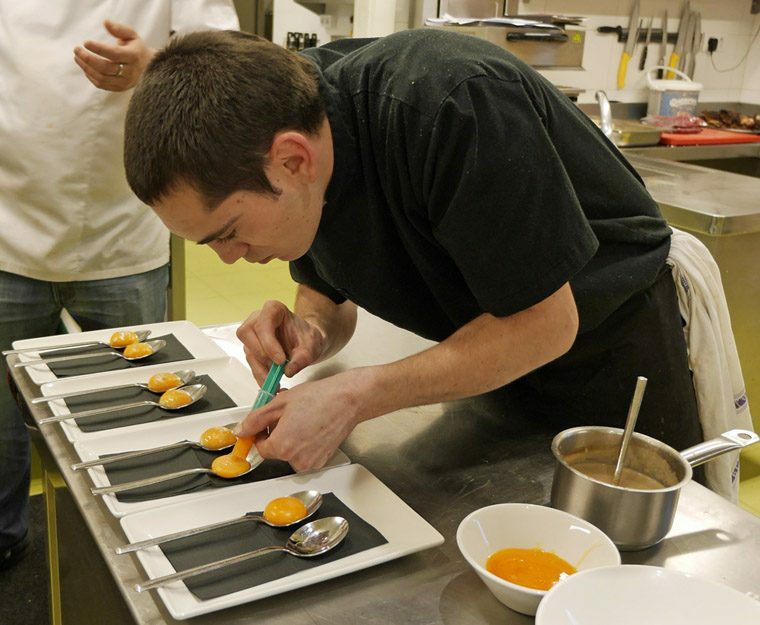 There are 8 Michelin starred restaurants in Bilbao alone and around 40 in the Basque region, including several three-starred restaurants. And, refreshingly, you can dine for somewhere between £35-45 per person in the one-star restaurants – a snip of the price you’d pay in London. If you choose to avoid the Michelin Star restaurants, you’ll find the food doesn’t suffer at all. Every restaurant seems to be aiming high – at La Ribera, these egg yolks being injected with a warm mushroom and truffle sauce to form a wonderful amuse bouche are a good example of the kind of attention to detail we found throughout our visit. This was just the start of a mission – to find out more about how this small pocket of land, spanning the French and Spanish Atlantic coast developed such amazing restaurants. After five days I began to have a better insight – there’s more to come in my next posts. Looks like a great foodie, art and architecture trip to a region I’m hankering to visit. Pinned for future reference! 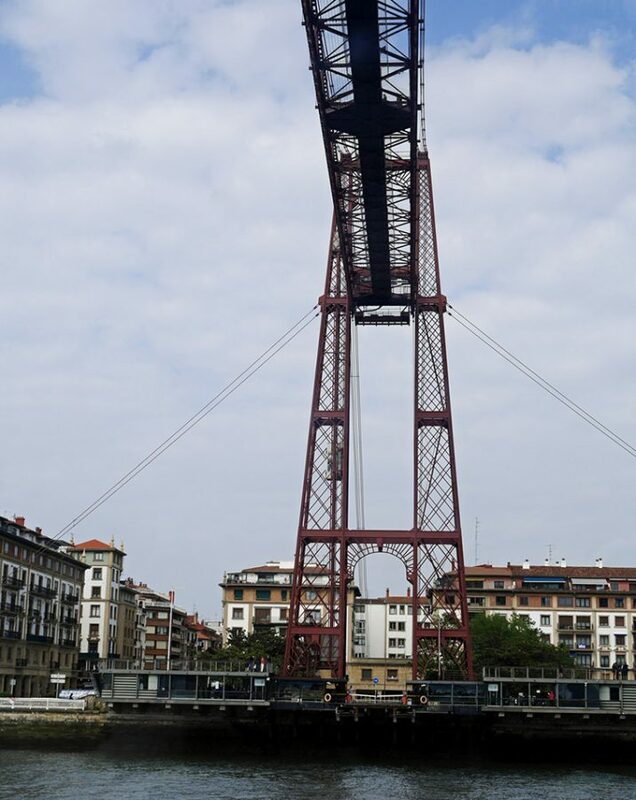 I hadn’t really heard much about Bilbao until your post – but the food and architecture alone make it look like a great spot to visit. My parents live in Spain but the don’t explore much – i’ll be sending them your post and telling them to get on their way!